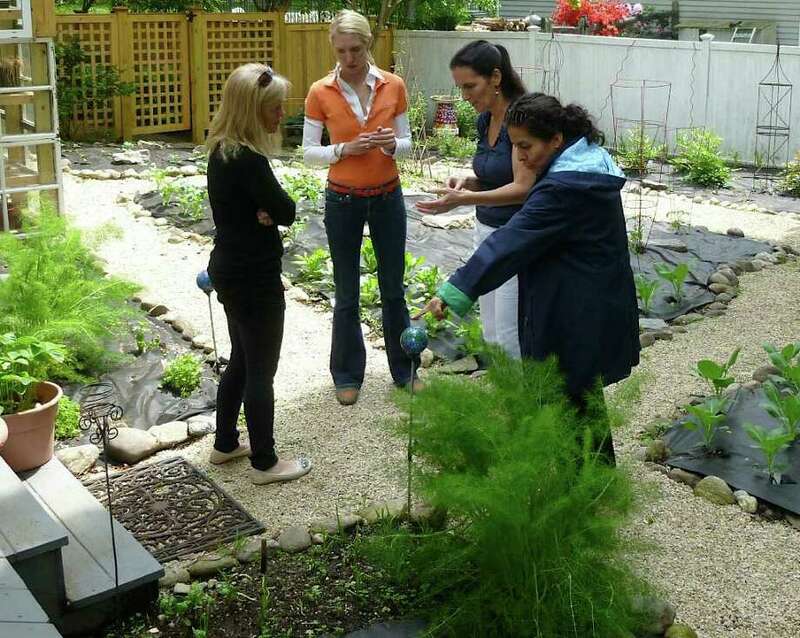 Heather Carey, second from right, leads participants in her "Kitchen Garden Workshop" on a tour of her home-based vegetable and herb garden. The theory is that the easiest way to eat locally and organically is to grow your own food. During a class Friday, Heather Carey showed a local group of women how to do just that. A culinary nutritionist, chef and founder of a business called Green Palette, Carey conducted a two-hour session in her lower Greenfield Hill home titled "Kitchen Garden Workshop." It covered the essentials of selecting a vegetable and herb garden including location, growing methods, soil, what to plant, supplies and maintenance. Carey got her professional start at the Natural Gourmet, a cooking school focused on natural and whole foods in Manhattan, from which she graduated in 1994. She then worked in the city as a private chef cooking for people with health problems and special dietary needs. In 1998, she moved to Fairfield, went back to school for a master's degree in clinical nutrition at New York University, started a family and began teaching cooking classes through the Welcome Club and at people's homes. Ultimately, she formed the home-based Green Palette business in 2009. "I wanted to be the chef who knew a lot about nutrition," she said. While her usual activity is healthy cooking instruction, Cary said growing your own food is another piece in the puzzle towards healthy eating. "I'm very passionate about gardening and have been doing it for many years," she said. "I've made a lot of mistakes but learned from them. It's easy to grow your own food and saves you money if you keep up with a program. It doesn't have to be a big operation -- it can be in pots." That idea was attractive to participant Jen Jagielo, who recently moved to the area from Michigan and was referred to Carey. "I live in a building with a large terrace and want to start a garden with potted vegetables and herbs," she said. Freshness was the appeal to Alcira Henao. "I like to cook and want to pick foods from my own backyard," she said. To start, Carey suggested keeping a gardening journal. "You want to note what worked and what didn't," she said. "Then you want to pick a location -- an area that gets at least eight hours of sun a day. Ideally, you want it to be close to the kitchen so you're not trekking out a mile. You want to protect your garden from animals, too." "I have a woodchuck that's a real problem," joked Mary Ellen Connelly. "It eats everything." Carey said there are a few approaches to growing: pots, in-ground and raised beds. "If you have a wet property, raised beds are the way to go," she said. "You can find them online, and you just put them together. This gives you the total advantage of putting in the best soil, with no weeds or rocks. Other advantages are that it's a defined space no one will walk through, easier to water and a space maximizer. A good basic bed is 3 feet by 6 feet." With regard to container gardening, Carey said it's a great alternative to raised beds, though the drawback is that you must be more mindful of watering. "Plastic pots are the way to go versus terracotta, which is prone to breaking," she said. "You can really plant anything in them." Soil is another key element. "It should be a mix of potting soil and compost," said Carey. "I take all my kitchen scraps to compost. You can compost in a tumbler or just have a defined out-of-the-way space. It takes awhile to change to soil but it's good rich earth. If you don't want to compost, you can buy it in bags at Home Depot." Choosing what to plant is important and comes down to personal preferences. Good warm-weather choices are tomatoes, peppers, squash, corn and cucumbers. Versatile herb choices include thyme, oregano, lavender, basil, parsley, sage, chives and rosemary. "Starting with seedlings is going to be more convenient than starting with seeds," said Carey. "You can catalog order seedlings or get them from a local nursery. The last frost date for this area was May 15, so the soil is warm enough. You kind of have permission to plant." Mapping out your garden is suggested before putting plants in. "You want to give your plants space to grow so they don't compete with each other," Carey said. Once planted, regular watering, weeding and harvesting is necessary to see the garden through to harvest. "The greatest enjoyment is reaping the fruits of your labor," said Carey. "I had some 200 cucumbers last year. We had cucumbers with everything!"